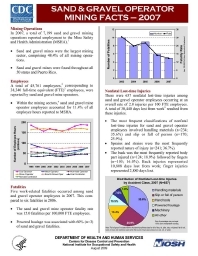 This 2007 mining fact sheet covers statistics of general interest relating to sand and gravel mining operations, workers, fatalities, nonfatal lost-time injuries, and occupational illness. In 2007, a total of 7,199 sand and gravel mining operations reported employment to the Mine Safety and Health Administration (MSHA). (1) Sand and gravel mines were the largest mining sector, comprising 48.4% of all mining operations. (2) Sand and gravel mines were found throughout all 50 states and Puerto Rico.